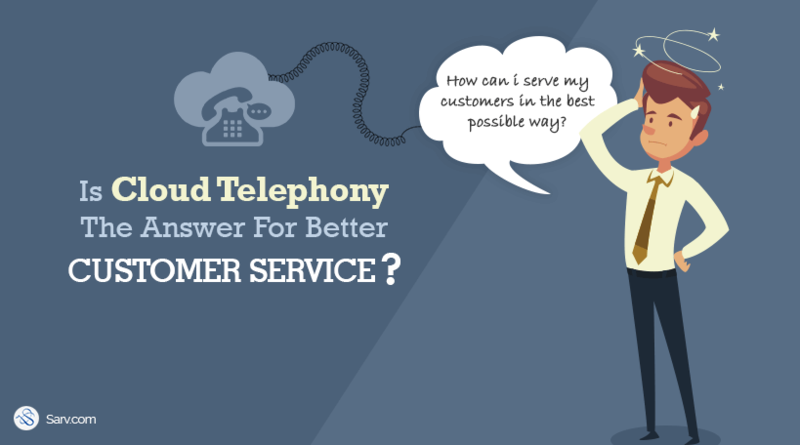 Is Cloud Telephony The Answer For Better Customer Service? The whole world today is digging out the ways to provide better customer service. And they are doing so because they know the power of customers. Do you also want to give better customer assistance, support them 24×7 and give your business a cutting edge? I believe you all aspire to the same. It brings me no surprise to know why “Providing Better Customer Service” is in trend nowadays. According to Gartner’s survey, More than 50% of organizations will redirect their investments to customer experience innovations by the end of 2018. Walker Study states that by the year 2020 customer experience will overtake price and product as key brand differentiation. No matter how big your company is, or how many skilled employees your company has. In the end, the only thing which counts is how you treat your customers. Like it or not, but your business is always known by the happy customers you have and what values you give to the society, not by how great your product is. Believe me, customers can either make the business or destroy it. If the whole story revolves around creating happy customers then what is the one thing you can do to improve the relationship with customers? How can you ensure no customer gets greeted by a busy tone? How can you make sure that all your customers are being attended? How can you end the call with a smile on customer’s face? Wondering what I’m talking about? Let me make it simple for you. Let’s assume Success is a mountain elevated at great heights. And your business is a rock climber who is trying to get to the top. Here cloud telephony is like the foothold which holds your feet at every point and helps your business to climb higher and higher. Cloud Telephony is up to 40 times more cost effective For SMB. According to a market survey, 95% of businesses are already using cloud telephony. During 2000 Cloud Telephony played a key role in the emergence and growth of BPO sector in India. According to recent market research, Cloud Telephony market in India is expected to touch $1.8 billion. Cloud Telephony removes the barrier and makes communication effective and simple between people from different regions. Not only this, it is also compatible to meet all the business needs. Here’s how cloud telephony can help your business. Cloud telephony helps you to give personalized experience to your customers. Simply integrate your CRM with IVR and you are all set to provide a customized experience to all your callers. Addressing all the callers with their names without letting them repeat their personal details was never so easy until cloud telephony came into the existence. It enables your business to handle huge call traffic all at once. The cloud-hosted IVR attends the call and delivers pre-recorded message. And if the customer doesn’t get satisfied then the call gets transferred to the live agent. The automated system decentralizes all the calls to the available agents in order to handle the huge traffic. This ensures smooth functioning of call flow and leaves an everlasting positive impression on customer’s mind. Yes, you heard right. Cloud Telephony solution enables customers to reach you easily and instantly. Cloud telephony solutions offer toll free number which can be easily remembered by your customers. Besides this, it’s free from callers end. This also encourages customers to call you whenever they wish to. A tollfree or vanity number creates a credible image of a business. Many research studies have found that a toll free number can improve sales by 30%. Undoubtedly cloud telephony service helps your business to pursue more opportunities. You can scale up infinite opportunities with this amazing marketing tool. Let’s suppose a random customer landed on your website seeking the same services you offer. He got all the details over the website. So what next? Will you let that customer go? By simply implementing a small “Click to Call” widget will prompt the customer to get connected with you easily. When clicked, this widget will initiate the call and connect the customer to the available agent. This ensures that your customers don’t navigate somewhere else because of lack of customer support. With cloud telephony, you never miss a potential customer, even if the call is missed. First, you can be sure that none of your customers will get to hear the busy tone. Second, all the call details are saved at a single place, So, if the customers call doesn’t get answered, then their details will be passed on to the sales representative, and customer will surely receive the call back from the company. Moreover, you can also be ensured that leads are being followed up time to time. This gives customers a sense of being cared and attended. Let’s suppose you’re going to run 2 campaigns altogether. Buy two different toll-free number (or virtual numbers) for both the campaigns. This way you can track responses of both campaigns. Furthermore, you don’t even need any infrastructure for this as everything happens over cloud. You can also use your tollfree vanity number in your email marketing campaigns and SMS campaigns as call-to-action. You can also put your virtual mobile number on your business cards and print media. I hope by now your problem to provide better customer service is solved. Go and get the cloud telephony now. Drop your views and thoughts below in the comment section. And we shall be back with more insights on cloud telephony.